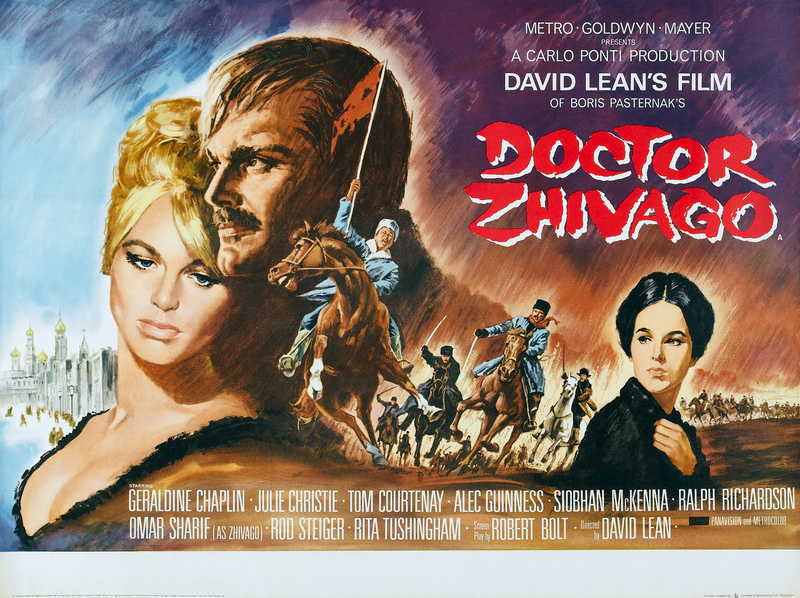 Doctor Zhivago – Did You See That One? Yuri (Sharif), a married physician and poet is in love with another woman (Christie). As Russia is pulled into World War I, Yuri tries to juggle his love for Lara and his devotion for his wife (Chaplin). The challenges Yuri faces multiply as the war gives way to the October Revolution. This is a classic piece of cinema directed by David Lean (Lawrence of Arabia). The film is based on Boris Pasternak’s novel of the same name, with a screenplay by Robert Bolt (The Mission). The cast includes great talents like Omar Sharif (Funny Girl), Julie Christie (Darling), and Rod Steiger (On the Waterfront). Tom Courtenay (Billy Liar), Alec Guinness (Kind Hearts and Coronets) and Geraldine Chaplin (The Impossible) are also a part of the incredible cast. This film was initially conceived by producer Carlo Ponti as a vehicle for Sophia Loren, his wife. Following his success with Lawrence of Arabia, Lean was looking for a more romantic film to work on. Omar Sharif, who had worked with Lean on Lawrence of Arabia was immediately interested in working on the project. Once Lean convinced Ponti that his wife wasn’t right for the film, the rest of the cast was put together. Interestingly, actors including Marlon Brando, Paul Newman, Max von Sydow, Michael Caine, and Audrey Hepburn were all considered for roles in this movie. The film would go on to be nominated for ten Academy Awards including Best Picture and Best Director. The story written for this film is an example of what makes an epic film work. The sweeping arc of the film covers a ton of ground without losing track of the important details of the people in the story. The story starts off strong, with an opening that asks all the right questions. The early part of the film does an excellent job introducing all of the characters in a way that keeps the story flowing. The characters themselves are all interesting, flawed, and somewhat unpredictable. The characters also evolve throughout the film, and the writing eases that evolution into the story in ways that keep it from feeling abrupt. Despite the big historical events being portrayed, the film balances the smaller aspects of the film nicely. The dialogue is also really nicely written, giving each character their own unique voice. While this movie could’ve easily become melodramatic the writing helps it to rise above that. The result is a powerful romantic drama based around the cost of war and the perils of revolution. The great writing earned Robert Bolt an Oscar for Best Adapted Screenplay. The acting in this film features a great collection of performances from all of the central cast members. Omar Sharif gives a wonderful performance in a role that almost works opposite to the tone of the film. As things around his character crumble, he brings out something strangely optimistic. His ability to find the right emotions in his role is another great aspect of the movie. He also has good chemistry with Chaplin and Christie, a necessity for this story. Julie Christie plays the complicated and intense Lara. Her adjustments really bring the evolution of her character to life in incredible ways. This evolution is one of the more important aspects of the story, and it’s nice to see it work so nicely. Geraldine Chaplin also does a great job in this movie. She finds good chemistry with Sharif despite the major differences in their characters. One of the great performances in this movie comes from Rod Steiger. He plays a man bent on self-preservation and self-serving actions. All of these less-than-noble qualities might have made him a clear villain in this one. Thankfully he understood the complex nature of his character, and he brings out a softer side that seems to cushion the movie from direct contact with the inner-bad guy. Alec Guinness also does a nice job in this movie. His role plays the part of narrator, but he’s not the central figure in the film. He finds a certain amount of distance in his interaction with the other characters that plays nicely. Finally, Tom Courtenay gives a powerful performance in this movie. His character evolves in a way that required him to almost be two separate people. His smaller role holds a key position in the film, and he doesn’t disappoint. Ultimately, he would earn an Oscar nomination for Best Supporting Actor. All of the main cast members bring this movie to life with performances worthy of the excellent story. The great story and wonderful acting are just a few of the successes of this movie. Cinematographer Freddie Young (Battle of Britain) does wonderful work putting the visuals together. Like the writing, Young manages to capture the bigger world of the film while still getting up close with the major characters in the story. The use of lighting, and frame-within-a-frame techniques are wonderful throughout the movie. He also has a consistency that works nicely in this one. For his work, Young was awarded with an Oscar for Best Cinematography. The film is also wonderfully edited. Norman Savage was nominated for Best Film Editing for his work on this epic film. Despite running for 197 minutes, there seems to be nothing in the film that isn’t necessary to the story. The film also won Oscars for Best Color Costume Design and Best Color Set Decoration. All of these aspects all came together in a movie that’s a visual masterpiece. The sound work for this film is another nice aspect of the production. Perhaps the easiest place to start is with the score, written by Maurice Jarre (No Way Out). He composed a moving score with themes that feel right at home with the story. He also found the right places to accentuate the film with his music, all the while remaining in tune with the tone. His work earned him his second Oscar win for Best Score. The film was also nominated for the Oscar for Best Sound. This is a classic and a great example of how to make an epic film work. Interestingly enough, the critics at the time were split on the value of this movie. Many of the questions of pro-Communism elements within the film no longer resonate in quite the same way. We also have the luxury of hindsight to see how little credence should be given to those criticisms. The combination of great elements comes together in the perfect storm, leaving a movie that has aged wonderfully despite being more than 50 years old. If you’re a fan of epic films this is one you must see. I would also suggest this to anyone who loves powerful dramas or romance. This is also a great movie that the fans of the stars should see. I give this one 5 out of 5 stars. I liked this, but It’s still not my favorite movie by Lean and unlike some of his other epics, this one felt a bit too long. I’ve heard people say that this one is too long before, but perhaps it’s just a preference thing. It’s not my favorite from Lean, but it’s up there. I’m glad you liked it. I know what you mean. Sometimes the extra material is not necessary to the story.